Trigonometry is based on triangles. The point of trigonometry is to find either the unknown side or angle of a triangle, when we know a side and an angle. Here is a little diagram to get you started (pretty isnt it). 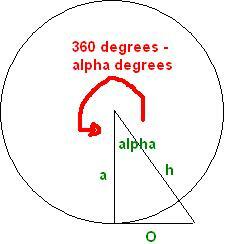 alpha is the angle in the corner where the angle is either known, or needed to be found. sin, cos and tan on your calculator. so to remind you alpha is our angle, so @ will be known now as our angle. So why do we need this? We need this when we want to find the length of a side in a triangle. If you have the length A and the angle @, then you can use trigonometry to find either H or O. And likewise for the lengths H and O. Next we can use trigonometry to find the unknown angle. of sine which is sin^-1, which should also be on your calculator. And that is all there is to trigonometry. You can find the sides and angles of a triangle using this. But how would we use this in a game you might say. Well take a little look at my next diagram (god I love mspaint). In the image above it shows you a rough idea of how you would make this into a camera for a game. You have yourself in the centre and have 360 degrees of rotation around. You can use trigonometry, and with your current angle, and knowing your current position to A(where you wish to go) you can determine your point at the corner of H and O. But that is just a quick reference I whipped up in 10 minutes. In the Radian tutorial you will find out just how the camera class relates to trigonometry in detail.